North Carolina is served by a decentralized public health system. There are 85 independent local health agencies in the state that are led by local government staff and six independent regional or district offices that are led by non-state employees. The Center’s Resource Library contains resources on cross-jurisdictional sharing (CJS) in North Carolina. Click here for information about the legal basis for CJS in the state from the Network for Public Health Law. A specific example of CJS in North Carolina can be found below. Cabarrus Health Alliance and Guilford County Health Department set out to explore a shared services model for their dental programs, naming this effort Project Smile. Select this link to read about this grantee and to access policies, procedures, tools and reports associated with their CJS initiative. Note: This is not a complete list of all CJS arrangements in the state. If you have examples to submit, please contact us at phsharing@khi.org. North Dakota is served by a decentralized public health system. There are 28 independent local health agencies in the state that are led by local government staff and eight independent regional or district offices. The Center’s Resource Library contains resources on cross-jurisdictional sharing (CJS) in North Dakota. Click here for information about the legal basis for CJS in the state from the Network for Public Health Law. A specific examples of CJS in North Dakota can be found below. This grantee was part of the Implementation and Impact Measurement Program. Montana is served by a decentralized public health system. There are 58 independent local health agencies in the state that are led by local government staff. The Center’s Resource Library contains resources on cross-jurisdictional sharing (CJS) in Montana. Click here for information about the legal basis for CJS in the state from the Network for Public Health Law. A specific example of CJS in Montana can be found below. This initiative explored CJS as a potential strategy to improve effectiveness and efficiency at Carbon County Health Department and RiverStone Health (Yellowstone County’s health department). Select this link to read about this grantee and to access policies, procedures, tools and reports associated with their CJS initiative. Maine is served by a mixed public health system. There are two independent local health departments in the state that are led by local government staff and there are nine state-run regional or district offices. The Center’s Resource Library contains resources on cross-jurisdictional sharing (CJS) in Maine. Click here for information about the legal basis for CJS in the state from the Network for Public Health Law. A specific example of CJS in Maine can be found below. The City of Portland Public Health Division convened a team to explore a shared model for public health service delivery among the city health department, the county within which the city is located, and the state public health department. Select this link to read about this grantee and to access policies, procedures, tools and reports associated with their CJS initiative. Oregon is served by a decentralized public health system. There are 34 independent local health agencies in the state that are led by local government staff. The Center’s Resource Library contains resources on cross-jurisdictional sharing (CJS) in Oregon. Click here for information about the legal basis for CJS in the state from the Network for Public Health Law. Specific examples of CJS in Oregon can be found below. Deschutes, Jefferson and Crook Counties pursued a shared approach to public health preparedness activities. They named their initiative Public Health Emergency Preparedness for Central Oregon (PHEPCO), and ultimately focused on developing shared risk communications and a joint medical surge plan. Select this link to learn more. This grantee was part of the Center’s Small Grant Program. Health departments and behavioral health agencies in Clatsop and Columbia Counties were interested in developing a regional model of a case referral and management program for kids with special health needs. Though a memorandum of understanding could not be promulgated during the grant period, Clatsop County provided an excellent insight into the benefits, drawbacks and challenges of establishing a regional model that relies upon local teams in different jurisdictions. Polk County and contiguous Marion County explored the feasibility of cross-jurisdictional sharing. They ultimately decided to focus on communicable disease control activities in order to align their efforts with the state goal of public health modernization implementation. Three Oregon counties have shared the staffing of their health officer positions since 2006, with a resulting increase in efficiency and expertise. Select this link to learn more. California is served by a decentralized public health system. There are 61 independent local health agencies in the state that are run by local government staff. The Center’s Resource Library contains resources on cross-jurisdictional sharing in California. Click here for information about the legal basis for CJS in the state from the Network for Public Health Law. A specific example of CJS in California can be found below. The International Community Foundation (ICF) spearheaded this effort to develop a formal and sustainable mechanism for San Diego and Imperial Counties, the State of California, and the State of Baja California (Mexico) to continue their cooperative efforts to address cross‐border tuberculosis (TB) cases. Select this link to learn more about this grantee. Iowa is served by a decentralized public health system. There are 101 independent local health agencies in the state that are led by local government staff. The Center’s Resource Library contains resources on cross-jurisdictional sharing in Iowa. Click here for information about the legal basis for CJS in the state from the Network for Public Health Law. A specific example of CJS in Iowa can be found below. Published by the Center for State and Local Government Excellence, in collaboration with the Center for Sharing Public Health Services. Webster County, Iowa, is the largest of a group of rural counties northwest of Des Moines. These counties share staff to deliver public health services that might not be economical if each county were to attempt to provide those services on their own. Other counties in the partnership are Buena Vista, Calhoun, Clay, Dickinson, Emmet, Greene, Hamilton, Hardin, Humboldt, O’Brien, Palo Alto, Pocahontas, Sac and Wright Counties. Connecticut is served by a decentralized public health system. There are 53 independent local health agencies in the state that are led by local government staff. There also are 20 independent regional or district offices led by non-state employees. The Center’s Resource Library contains resources on cross-jurisdictional sharing in Connecticut. Click here for information about the legal basis for CJS in the state from the Network for Public Health Law. A specific example of CJS in Connecticut can be found below. Published by the International City/County Management Association, in collaboration with the Center for Sharing Public Health Services. This case study features a regional public health district formed by ten towns in Eastern Connecticut, the largest of which provides many administrative services through a long-term service agreement. The towns include Andover, Ashford, Bolton, Chaplin, Columbia, Coventry, Mansfield, Scotland, Tolland and Willington. Vermont is served by a centralized public health system. There are 12 state-run or regional offices in the state. Click here for information about the legal basis for CJS in the state from the Network for Public Health Law. A specific example of CJS in Vermont can be found below. The Center is seeking information about CJS models and arrangements in Vermont. Please email us at phsharing@khi.org if you have examples to share. A strategic public health imperative in Vermont is to employ the Health Impact Assessment (HIA) process across the state. The small size of most district offices makes it impractical to ensure that each one is fully equipped to conduct HIA processes on its own. The Burlington District Office provided training and technical assistance to the St. Johnsbury District Office on conducting an HIA. This is an example of using CJS as a temporary strategy to build capacity. Florida is served by a shared public health system. There are 67 state-run local health agencies in the state. Click here for information about the legal basis for CJS in the state from the Network for Public Health Law. A specific example of CJS in Florida can be found below. The Center is seeking information about CJS models and arrangements in Florida. Please email us at phsharing@khi.org if you have examples to share. The Capital Consortium is one of eight regional county health department (CHD) consortia established by the Florida Department of Health (DOH). The consortia were established to consolidate the operation of some public health services and administrative functions at the regional level, rather than each individual CHD providing them. The Capital Consortium encompasses 10 health departments (Calhoun, Franklin, Gadsden, Gulf, Jefferson, Leon, Liberty, Madison, Taylor and Wakulla Counties). This consortium evaluated how well their shared IT support model is performing and identified needed improvements. Nebraska is served by a decentralized public health system. There are two independent local health agencies in the state that are led by local government staff. There also are 19 independent regional or district ofﬁces led by non-state employees. The Center’s Resource Library contains resources on cross-jurisdictional sharing (CJS) in Nebraska. Click here for information about the legal basis for CJS in the state from the Network for Public Health Law. A specific example of CJS in Nebraska can be found below. The Nebraska Association of Local Health Directors designed a template website with input from 18 local health departments across the state. Six health departments have adopted the template and it is available for other health departments to use in the future. Kentucky is served by a shared public health system. There are 61 independent local health agencies in the state. The Center’s Resource Library contains resources on cross-jurisdictional sharing (CJS) in Kentucky. Click here for information about the legal basis for CJS in the state from the Network for Public Health Law. Specific examples of CJS in Kentucky can be found below. The health departments in Bourbon, Clark and Montgomery Counties developed an agreement to engage in a tri-county fitness challenge. They anticipate using the agreement as the foundation for additional sharing activities in the future. Published by the International City/County Management Association (ICMA), in collaboration with the Center for Sharing Public Health Services. This case study presents a five-county public health district that provides all administrative and program services for the participating counties: Caldwell, Crittenden, Livingston, Lyon and Trigg. Washington is served by a decentralized public health system. There are 35 independent local health agencies in the state that are led by local government staff. There also are four state-run regional or district offices. The Center’s Resource Library contains resources on cross-jurisdictional sharing (CJS) in Washington. Click here for information about the legal basis for CJS in the state from the Network for Public Health Law. Specific examples of CJS in Washington can be found below. Case Study: This report includes details about how the effort progressed, factors that hindered the desired progress, and lessons that could inform other jurisdictions interested in similar pursuits. Summary Report: This report was published in 2015 and provides a summary of the site’s activities during the time it was a demonstration site for the Center. The information in this report also is included in the more comprehensive Case Study described above. The Washington State Department of Health collaborated with the Washington Public Health Centers for Excellence and the Washington State Association of Local Public Health Officials to improve the statewide immunization program. The project partners worked on options for a new, regional approach to administering the Vaccines for Children (VFC) program and the Assessment, Feedback, Incentives eXchange (AFIX) program’s quality improvement activities. Michigan is served by a decentralized public health system. There are 45 independent local health agencies in the state that are led by local government staff. The Center’s Resource Library contains resources on cross-jurisdictional sharing (CJS) in Michigan. Click here for information about the legal basis for CJS in the state from the Network for Public Health Law. Specific examples of CJS in Michigan can be found below. The Northern Michigan Public Health Alliance, comprising 25 rural counties served by six local health departments, was established to facilitate CJS across the region. The alliance was formed through a memorandum of understanding (MOU) signed by the chairs of the six boards of health. It is guided by a steering committee that consists of the four health officers representing six health departments. During the time it was part of the Center’s Shared Services Learning Community, the alliance prepared county-specific inventories of current capacity and an inventory of current CJS arrangements; analyzed different CJS models and identified those seen as most feasible for the region; developed a CJS strategic plan that included goals for each department as well as identification of common goals across the region; and prepared a feasibility study examining the potential for multi-jurisdictional accreditation. The alliance also established partnerships with the health care organizations that serve the region. Select this link to read about this grantee and to access policies, procedures, tools and reports associated with their CJS initiative. This grantee also was part of the Center’s Implementation and Impact Measurement Program. The Health Department of Northwest Michigan formed Dental Clinics North–a shared dental initiative–in 1999 for six local health departments. The goal of the CJS arrangement was to stabilize the delivery of oral health services to low-income people. In 2006, they founded Michigan Community Dental Clinics, Inc. (MCDC), a not-for-profit management services corporation. Through MCDC, the successful Dental Clinics North model for delivery of public health dental services now covers the entire state. In 2012, they served over 70,000 patients with a primary focus on adults and children on Medicaid, as well as low-income, uninsured individuals. Select the link for more information about the Michigan Community Dental Clinics. Massachusetts is served by a decentralized public health system. There are 351 independent local health agencies in the state that are led by local government staff. There also are 16 independent regional or district offices that are led by non-state employees. The Massachusetts Public Health Regionalization Project is striving to strengthen the Massachusetts public health system by creating a sustainable, regional system for equitable delivery of local public health services across the Commonwealth. As part of the project, the Massachusetts Department of Public Health received a five-year award from the Centers for Disease Control and Prevention for the Public Health District Incentive Grants (PHDIG) program, and funded five sites across the Commonwealth that are sharing services. Read more about the regionalization program and each site here. The Center’s Resource Library contains resources on cross-jurisdictional sharing in Massachusetts. Click here for information about the legal basis for CJS in the state from the Network for Public Health Law. Specific examples of CJS in Massachusetts can be found below. The alliance, which was formed to strengthen public health in the region, comprises the City of Worcester and six contiguous towns of varying sizes. It is led by the City of Worcester Public Health Division. During the time the alliance was part of the Center’s Shared Services Learning Community, it consolidated environmental health programs in the region, developed a regional Community Health Improvement Plan, and implemented programs to decrease tobacco and drug use throughout the region. Select this link to read about this grantee and to access several policies, procedures, tools and reports associated with their CJS initiative. The city of Melrose and the town of Wakefield in Massachusetts have had a formal agreement to share local health department staff. Melrose is the formal employer of all the shared staff included in the arrangement and is responsible for the provision of compensation and benefits. Wakefield reimburses Melrose for the staff time dedicated to its public health needs. Select this link to read more. Wisconsin is served by a decentralized public health system. There are 88 independent local health agencies in the state that are led by local government staff. There also are five state-run regional or district offices in the state that are led by state employees. The Center’s Resource Library contains resources on cross-jurisdictional sharing in Wisconsin. Click here for information about the legal basis for CJS in the state from the Network for Public Health Law. Specific examples of CJS in Wisconsin can be found below. Seventeen health departments and one tribal health department agreed to explore CJS opportunities in an effort to improve effectiveness, efficiency, capacity and performance as defined by the Public Health Accreditation Board (PHAB) standards and measures. Select this link to read about this grantee and to access policies, procedures, tools and reports associated with their CJS initiative. Alaska is served by a mixed public health system. There are two independent local health departments in the state that are led by local government staff. The Center’s Resource Library contains resources on cross-jurisdictional sharing (CJS) in Alaska. Click here for information about the legal basis for CJS in the state from the Network for Public Health Law. Can you help us learn more about CJS in Alaska? Nevada is served by a largely decentralized public health system. The Center’s Resource Library contains resources on cross-jurisdictional sharing (CJS) in Nevada. Click here for information about the legal basis for CJS in the state from the Network for Public Health Law. Specific examples of CJS in Nevada can be found below. This grantee was part of the Center’s Shared Services Learning Community and also was part of the Center’s Small Grant Program. Carson City Health and Human Services developed and implemented a CJS arrangement to deliver environmental health services to neighboring Douglas County. The effort included a detailed communications plan for Carson City employees as well as Douglas County business owners affected by the change. A branding strategy also was implemented to reflect the new city-county program. In addition, the project team developed a CJS model and implementation toolkit for neighboring jurisdictions that might be interested in pursuing similar agreements. For the complete story, read the Center’s 2018 CJS Case Report about the site. Select this link to read about this grantee and to access policies, procedures, tools and reports associated with their CJS initiative. Eight counties explored cross-jurisdictional sharing as a way to improve public health effectiveness and efficiency in Northern Nevada. Churchill, Elko, Eureka, Humboldt, Lander, Pershing, Washoe and White Pine Counties were involved. Select this link to read about this grantee and to access policies, procedures, tools and reports associated with their CJS initiative. Minnesota is served by a decentralized public health system. There are 49 independent local health agencies in the state that are led by local staff. There also are eight state-run district offices. The theme of local public health governance change has been prevalent across the state since 2010, when “Updating Minnesota’s Blueprint for Health” was released. In particular, Appendix F of the Blueprint is “A Discussion Guide for Exploring Public Health Governance and Structure Change.” The Center’s Resource Library contains this and other resources on cross-jurisdictional sharing in Minnesota. Click here for information about the legal basis for CJS in the state from the Network for Public Health Law. Specific examples of CJS in Massachusetts can be found below. This grantee was part of the Center’s Shared Services Learning Community and also the Center’s Implementation and Impact Measurement Program. In 2015, three previously independent health departments in West Central Minnesota consolidated into one new health department called Horizon Public Health. This five-county, regional public health organization serves approximately 67,000 people. Select this link to read about this grantee and to access policies, procedures, tools and reports related to their consolidation. Select this link to read about their impact measurement activities. PartnerSHIP 4 Health: Find more information about this initiative below. PartnerSHIP 4 Health, one of the Minnesota System Wide pilot sites, is a new community health board that governs the four local health departments serving Becker, Clay, Otter Tail and Wilkin Counties. Since its establishment, PartnerSHIP 4 Health has undertaken a four-county community health improvement planning process, developed sequential strategic plans and implemented a branding strategy. Four programs are now shared among all departments, with staffing models, policies and procedures designed by the involved staff. It is anticipated that more programs will be shared in the future as opportunities arise with staff turnover and new grants. For the complete story, read the Center’s 2018 CJS Case Report about the site. Select this link to access policies, procedures, tools and reports associated with their CJS initiative. New York is served by a decentralized public health system. There are 58 independent local health agencies in the state that are led by local staff. There also are 12 state-run district offices. The Center’s Resource Library contains additional resources on cross-jurisdictional sharing in New York. Click here for information about the legal basis for cross-jurisdictional sharing in New York from the Network for Public Health Law. Genesee County and Orleans County health departments in rural New York implemented a plan to share a director and deputy director. Additional sharing has developed over time, resulting in enhanced quality of services and reduced costs. Select this link to read the Center’s 2017 CJS Case Report about this grantee and to access several policies, procedures, tools and reports associated with their CJS initiative. The S2AY Rural Health Network is a horizontal network of the eight public health departments located in the Finger Lakes Region of Upstate New York. The Finger Lakes Public Health Alliance (FLPHA) is a workgroup of the network that focuses on sharing best practices relating to public health emergency planning. With support from the small grant, the network developed a regional operational plan with procedures for implementation, improved communication systems, monitoring and process improvement. Kansas is served by a decentralized public health system. There are 100 independent local health departments in the state that are led by local staff. There also are six state-run district offices. Kansas public health departments have committed to a multi-year process aimed at modernizing the Kansas public health system. This grassroots effort focuses on the Kansas Foundational Public Health Services (FPHS) model, a minimum package of public health services that should be available to all Kansans. Cross-jurisdictional sharing (CJS) provides one option for health department leaders, working with boards of health, to ensure that their communities have access to the FPHS. The Center’s Resource Library has materials developed by public health leaders in Kansas to facilitate CJS as a strategy to provide FPHS, including a report on FPHS and Opportunities for CJS, guidance for local boards of health, and a role-play exercise. Click here for more information and resources on cross-jurisdictional sharing in Kansas. 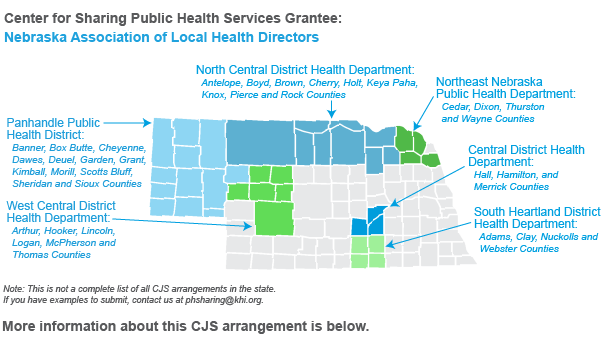 Click here for information from the Network for Public Health Law about the legal basis for cross-jurisdictional sharing in Kansas. The American Heart Association in Kansas is working on behalf of the four federally recognized Native American Tribes in the state—Iowa Tribe of Kansas and Nebraska, Kickapoo Tribe in Kansas, Prairie Band Potawatomi Nation, and the Sac and Fox Nation of Missouri in Kansas and Nebraska. The tribes are developing a data-sharing arrangement, and they are using a research project on tribal youths’ perception of health as the basis for the arrangement. This case study features two county health departments in Kansas that considered sharing a family planning program. Although the CJS arrangement did not move forward, some important lessons were learned as a result of the process. Fiscal and Service Issues: Butler and Greenwood County Health Departments conducted a feasibility study to explore a potential shared family planning program. What? / Phase One: Butler and Greenwood County Health Departments conducted a feasibility study to explore a potential shared family planning program. Colorado is served by a decentralized public health system. There are 54 independent local health agencies in the state that are led by local government staff. For information about the legal basis for cross-jurisdictional sharing in Colorado, read this document from the Network for Public Health Law. The Center’s Resource Library contains additional resources on cross-jurisdictional sharing in Colorado, including a number of documents used to establish and support the San Luis Valley Public Health Partnership. The San Luis Valley Public Health Partnership was formalized to facilitate cross-jurisdictional sharing (CJS) arrangements between and among three rural and three frontier counties, with a specific goal of optimizing the effectiveness, efficiency, capacity and performance of core public health services. For the complete story, visit the grantee’s web page to read the Center’s 2017 case report and to access several policies, procedures, tools and reports associated with their CJS initiative. This grantee also is part of the Center’s 2017 Small Grant Program. The San Luis Valley Public Health Partnership will develop and implement a cross-jurisdictional data collection and management system. The following counties participate in the partnership: Alamosa, Conejos, Costilla, Mineral, Saguache and Rio Grande. This grantee is part of the Center’s 2017 Small Grant Program. This partnership, which comprises six frontier and rural counties, is seeking to improve communications among member counties and to assess the effectiveness of and capacity for shared services and activities. The following counties participate in the partnership: Delta, Gunnison, Hinsdale, Montrose, Ouray and San Miguel. This partnership also was the subject of a case study published by the Colorado Trust in September 2012. Health officials from six counties along Colorado’s Western Slope came together with a common goal of strengthening the region’s public health infrastructure. Their effort culminated in the establishment of the West Central Public Health Partnership (WCPHP). In the years that followed, officials enacted intergovernmental agreements outlining partnership roles and responsibilities, and participants embarked on numerous cross-jurisdictional public health campaigns and programs. This case study describes an in-depth evaluation of the WCPHP to identify the organizational elements that contributed to the group’s successes. This case study examines how an inter-governmental agreement (IGA) has been used to enable Prowers County, Colorado to provide public health administrative services for its neighbor, Kiowa County. This document examines how two other states are using CJS to provide Foundational Public Health Services. The report examines how the Kansas public health system could consider similar strategies moving forward. Accreditation / Essential Services: The Foundational Public Health Services model is a package of capabilities and services that must be provided to keep the public safe and healthy. What? / Phase One: Sharing capacity and resources through CJS has been identified as one possible way to provide FPHS. Several other states have already taken steps to move toward the implementation of the FPHS model, and have identified CJS as a key strategy for that purpose. Governance: One key consideration when examining the authorities for CJS is the extent to which local governments have the ability to self‐govern and set policies. Legal Issues: One key consideration when examining the authorities for CJS is the extent to which local governments have the ability to self‐govern and set policies. Governance / Phase Two: One key consideration when examining the authorities for CJS is the extent to which local governments have the ability to self‐govern and set policies. Legal Issues/ Phase Two: One key consideration when examining the authorities for CJS is the extent to which local governments have the ability to self‐govern and set policies. Change Management: Answers this question: How can the sharing arrangement sustain those kinds of change and still continue forward? Monitoring and Improving / Phase Three: Answers this question: What lessons did you learn that might help other grantees implement similar work in this field? Ohio is served by a decentralized public health system. There are 120 independent local health agencies in the state that are led by local staff. There also are two state-run regional or district offices. Cross-jurisdictional sharing (CJS) has received a great deal of attention in Ohio since 2011. At the time, state law allowed the state’s director of health to mandate accreditation, and currently health departments have until July 1, 2020, to become accredited by the Public Health Accreditation Board. Almost simultaneously, the Association of Ohio Health Commissioners released a proposed model for Ohio’s local governmental public health system that includes a mechanism for governance and sustainable financing, considers cross-jurisdictional sharing and/or regionalization, enhances quality and assures value. The Center’s Resource Library contains additional resources on cross-jurisdictional sharing in Ohio. Click here for information about the legal basis for cross-jurisdictional sharing in Ohio from the Network for Public Health Law. Portage County Health District expanded to include the city of Ravenna, resulting in enhanced services for Ravenna. Simultaneously, the health district and the city of Kent engaged in a joint community health improvement planning process that has successfully engaged numerous partners in countywide efforts to further protect and promote the health of all residents. Select this link to read the Center’s 2017 CJS Case Report about this grantee and to access several policies, procedures, tools and reports associated with their CJS initiative. This grantee was part of the Center’s 2016 Small Grant Program. Franklin County Public Health and the neighboring health departments in Delaware and Licking Counties collaborated on the planning and implementation of a new solid waste program module in the state’s environmental health database.